If you're a Sony shooter who's been hankering after a neat little compact prime lens, Samyang may have the answer in the shape of its new AF 24mm f/2.8 FE wide-angle optic. Designed for Sony's full-frame mirrorless range of cameras like the Alpha A7 III and A7R III, the new lens has been billed as 'tiny but wide' by the brand, and when you look at the stats it's easy to see why. The lens weighs in at just 93g, and, with a lens design made up of seven elements in seven groups, measures just 37mm front to back. The AF 24mm f/2.8 FE features what Samyang calls 'Ultra Multi-Coating', which is designed to minimize chromatic aberration and unnecessary light dispersion to deliver more accurate colors. Three of the optical elements are also aspherical lenses, and two are high-refractive lenses. 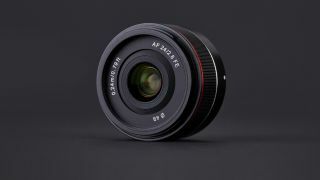 While Samyang is probably known for its manual-focus optics, its new AF 24mm f/2.8 FE wide-angle prime is part of company's growing autofocus line, with Samyang promising fast and accurate AF. It also has a minimum focusing distance of just 0.24m, and sports a rubberized focus ring for manual focusing. Never heard of Samyang before? Don't worry – its lenses retail under the Rokinon brand name in the US, where the news lens will be available in July at a price of $399. Pricing and availability for the UK and Australia are to be confirmed.